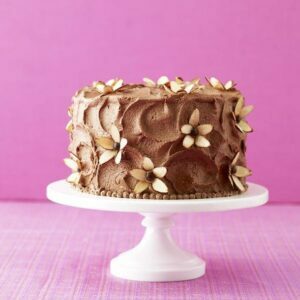 Tasty almond cake with milk-chocolate frosting - a truly divine combination. Heat oven to 375ºF. Grease three, 8-inch round cake pans; line bottoms of pans with parchment, grease and flour, tapping out excess; set aside. Stir together flour, baking soda and salt; set aside. Combine granulated sugar and almonds in a food processor until finely ground. In a mixing bowl, beat together almond mixture and butter until light and fluffy. Beat in eggs and extract and scraping down sides of bowl. Stir in flour mixture and buttermilk alternately in three parts, starting and ending with flour. Divide batter among pans and bake until cake springs back when touched in the center, about 25 min. Cool 15 min in pan. Turn cakes out of pans and cool completely. If necessary, trim domed tops from cakes. Set one cake on serving plate and spread with ¾ cup frosting. Repeat with second cake and top with third cake. Frost entire cake with a generous layer of icing. Decorate with sliced almonds, forming flowers by using chocolate candies for the centers.